In the northern and remote village areas of Thailand curries are made without coconut milk in order to keep costs down, thus the term "jungle curry". The taste is rich in herbs and spices, and not nearly as fattening as curries made with coconut base. 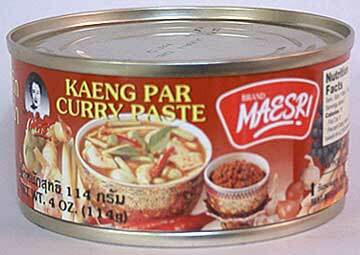 This is a vegetarian curry paste also. To make, just stir-fry one can into 3 cups boiling water, and cook for about 3 minutes. Add 1 lb chicken or beef, and stir until cooked. Add eggplant or seasonal squash, chopped carrots, green beans and 3 tbsp fish sauce (optional, you may use salt instead). Also add sliced krachai if you prefer. Garnish with fresh Thai basil leaves and serve with jasmine rice or chantaboon rice stick noodles. Maesri Brand is recognized in Thailand as a high quality export product with rich taste and authentic flavor. The convenient and inexpensive 4 oz can is enough for 6 large servings, and we ship this in case quantity to many restaurants who depend on Maesri to make their restaurant Thai meals. Chances are good that your local Thai restaurant uses Maesri as the base for their jungle curry. Ingredients: Ingredients: garlic, dried red chile, wild ginger, lemongrass, shallot, salt, galanga, sugar, kaffir lime, coriander seeds. Product of Thailand.